Our alumni are living, working, and contributing in exciting and important ways to their communities all over the world, including in China, Japan, Korea, Germany, Ireland, Scotland, Texas, New York, Montana, Indiana, California, and all over the Northwest. Our Linguistics Program can lead students not only to find interesting and engaging careers and jobs but also to give back to their communities in important ways. They are teaching, creating, writing, analyzing, and serving in a vast array of careers and civic engagement. Western’s Linguistics Program now has about 115 majors and 25 minors. We have 22 affiliated faculty members from 10 programs and departments out of three colleges, and an eager and active Associated Students Linguistics Club. We are faced with the fact, however, that we have become a “state-assisted” rather than “state-funded” school. Your financial support can help the Linguistics Program to offer scholarships and awards to our outstanding and deserving students. We would also love to be able to send our students to academic conferences and events outside of Western. This opportunity would greatly enrich our students’ experience. Please give to Western’s Linguistics Program on June 1st, 2017, WWU’s official “Give Day,” where a percentage of all donations will be matched by generous donors. Gifts made at the IPA level add up to make a big impact on one or two students a year. Gifts at the Allophone level will allow students to explore their interests and passions with Linguistics. Support at the Allomorph level helps students realize their goals. 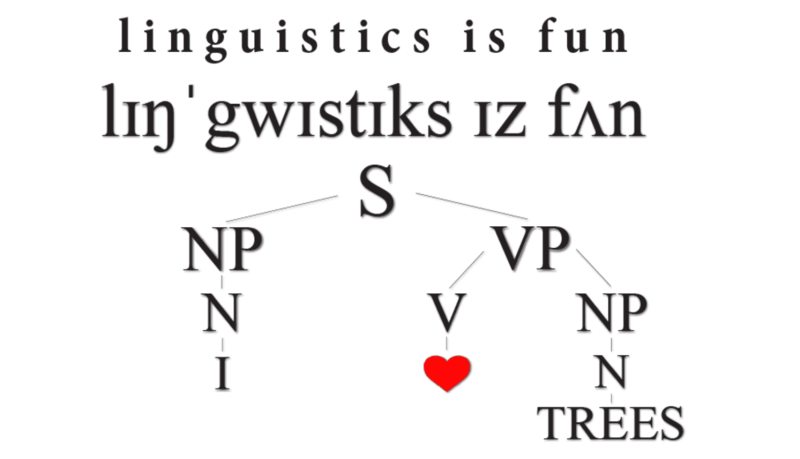 Gifts made at the Polysynthetic level make a Linguistics scholarship a reality!